Go on a nature walk or hike. Write down all the signs of spring you see along the way-new flowers and plants starting to bloom, bugs and other critters on the ground, birds and butterflies in flight. Turn your nature walk into an art project. Draw a picture of the animals or plants you observe, and look up their names in a local nature guide or an encyclopedia from the library. 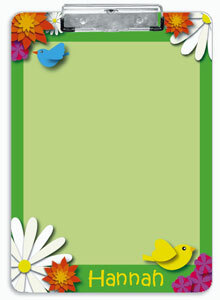 Write a spring poem or short story. Give your kids a list of related words to incorporate to get them started, or let their imaginations run wild. (If you are stuck trying to find the perfect rhyme, try the handy rhyming dictionary. Go on a scavenger hunt. Write down a list of spring sounds (frogs singing, music from an ice cream truck) or sights (people on a picnic, newborn animals) and go on a mission to find all of them. Take a look at more ideas for scavenger hunt clues. Take your clipboard on spring break for long plane or car trips. Bring dry erase markers and play games or draw directly on the clipboard for hours of entertainment. How else do you use your Frecklebox clipboards? Add your suggestions to the comments section. Next: Next post: Does Anyone Actually Like Daylight Savings Time?